Clearly, this is not another Christmas nail art idea. Please forgive me that I am now breaking my promise of sharing a series of nail designs inspired by the yuletide season that started with my Christmas Garlands nail art a few days ago. I have a good reason for this, promise! 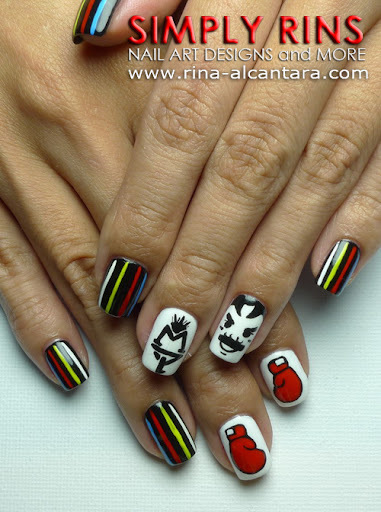 This nail art is a tribute to Filipino pound-for-pound boxer, Manny "Pacman" Pacquaio, who successfully defended his welterweight title against challenger, Juan Manuel Marquez last November 13 at MGM in Las Vegas. Once again, you gave pride to your fellow Filipinos. We are truly proud of you. 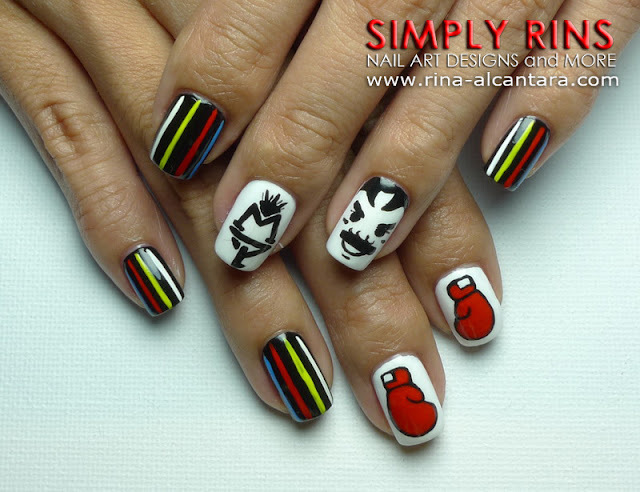 And since nail painting is what I love to do, I hope this Manny Pacquaio inspired nail design is enough to show my appreciation to your dedication and hard work. Base colors are Sally Hansen Black Out for black and OPI Alpine White for accent nails, polished in 2 coats. All designs were hand painted using acrylic paints and nail art brushes. I made 4 accent nails, 2 on each hand. 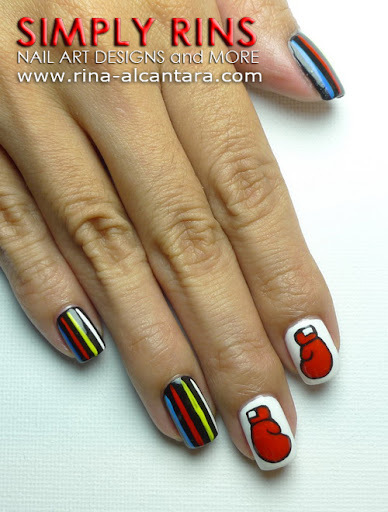 On my right hand, I chose to paint boxing gloves to represent the sport of boxing. Like I always do, I try to place a simpler design on my right hand as I'll be working with my weaker hand. The gloves, I think, is a good choice. I wanted to paint the Philippine flag in one of my nails but we were running out of time. I'll explain this in awhile. ;) I didn't want to leave the other nails bare so I figured I'd paint some stripes using the colors of our flag. It was a good compromise and I liked it. Okay, so why was my hand shaking and why didn't I have time to paint our country's flag? 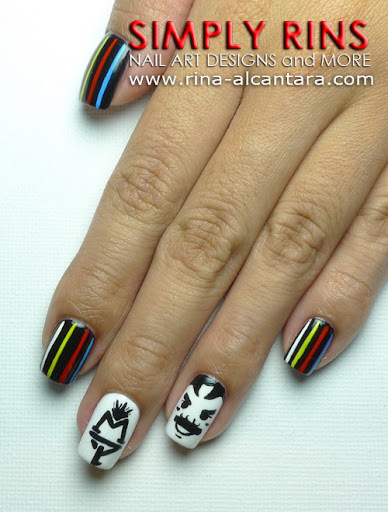 You see, a few days ago, I gladly obliged to a request by a local television network to feature my Manny Pacquaio nail art. Yesterday was the day of the shooting and I was really nervous that my hand kept shaking. They also wanted to cover a lot of nail art ideas that I didn't have enough time to do the flag. I was particularly excited for this feature because I did the design on my own nails! I know I don't have exactly the prettiest hands, but this opportunity is a dream come true for me. I have long wanted to record on video how I paint my nails. But nail artists would agree that we can't just place our hand flat on the table all the time, so mounting a video camera on a tripod simply wouldn't work all the time. But having a cameraman scrutinizing me while I work made me really conscious that I made some erasures on the design during the shoot. In fact, I was more nervous working on my nails compared to the short interview. Nevertheless, the experience was awesome! 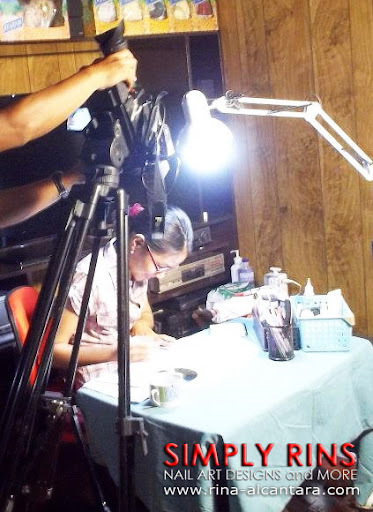 The feature will be aired this Sunday, November 20 at GMA News TV, Channel 11 at 8:00pm. Other Manny Pacquaio inspired creations by other Filipinos will also be featured. If you have time, I hope you can watch the news segment and perhaps you can get a glimpse of how I paint my nails! To my international friends, I will be posting a video of the segment once it has been uploaded by the television network. To everyone, thank you for appreciating my nail designs. It is because of you that opportunities like this knocks on my door. That is so perfect!! Yay PAC MAN for keeping his title of Champion!! Now you are a celebrity :D you are always on TV XD Congratulations!! I cannot wait to watch the video!! too bad. i missed it by few mins. hope you could upload a video. Hi, C.L.M.`s Nail Art Blog! wish to be like u someday! !